Fire Chief Bill White with Templeton Fire and Emergency Services Firefighter of the Year Trevor Aguilar. 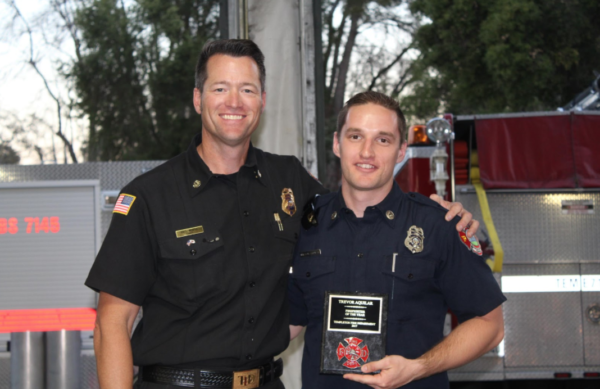 –Firefighter Trevor Aguilar was recognized as the 2017 Firefighter of the Year at the Templeton Firefighters Annual Recognition Dinner held on Thursday, March 29. The Firefighter of the Year is selected by his/her peers on the following criteria: Being a team player, making the department a better place, the respect of their peers, constantly improving themselves, involvement in extracurricular projects and routinely responding to emergency service calls. Firefighter Aguilar joined Templeton Fire and Emergency Services as a Paid Call Firefighter in 2015. “Firefighter Aguilar has been extremely dedicated to being the best firefighter possible and has shown a commitment to providing emergency services to Templeton,” said Fire Chief Bill White. “Trevor has made a difference in our organization and community. His dedication to the Department, work ethic coupled with his desire to be the best, makes him a great firefighter,” said White. “Trevor exemplifies what Templeton Fire and Emergency Services is all about. The community is proud of him and what he means to us” said Templeton CSD Board President Wayne Petersen.